South Palm Desert 5 Bedroom, 4 Bath Private Home with Pool & Spa! Spectacular!! 2,900 Sq. Ft. 5 Bedroom, 4 Bath Home with Every Amenity you Could Hope For! You will absolutely fall in love with this beautiful 2,900 square foot vacation home. Guests will enjoy relaxing in the private yard with pool/spa, sunning area & outdoor kitchen with gas grill. Dine under the covered patio while you watch your favorite show on the 60" TV. 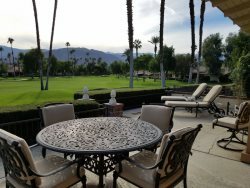 Conveniently located in desirable South Palm Desert, just minutes from world class shopping (El Paseo), dining, golf, hiking and just minutes away from the Living Desert Zoo. The living room features spectacular wood planked cathedral ceilings and multiple windows that bring in lots of glorious sunshine. This room has been beautifully furnished and can comfortably seat the entire family in front of the big screen cable TV mounted over a gas fireplace. Adjoining the living room is a formal dining room with seating for six, but an additional leaf can be added to accomidate more. The true heart of this home is undeniably the kitchen. The kitchen and dining areas offer the main access to the back patio and pool and plenty of space for the entire family to gather and visit. This room also has the spectacular wood planked ceilings, multiple South facing windows looking out at the pool and spa and a large flat screen cable TV. The completely updated mid-century modern kitchen/dining area has been furnished with a casual dining area and bar seating that can accommodate up to ten. The kitchen is fully equipped with a 6-burner gas range, double convection oven, stainless steel appliances, tons of counter top prep-space, storage and enough cooking supplies to feed an army! Two additional features that guests will appreciate are the wet bar with wine cooler and ice maker and a coffee bar. This home has an oversized master suite with private bath and a mother-in-law suite with private bath, which could be used as a smaller master suite. It also has three guest bedrooms and can sleep up to ten in beds. The East Wing: The master bedroom located in the East wing of this spacious home has been furnished with a comfortable king size bed with quality bedding, seating area and a 50” mounted cable TV. Through a newly installed barn-door, there is a brand new private en-suite with walk-in shower and his/hers vanities. There is also a walk-in closet with plenty of storage space. French doors lead out to the pool side patio. The master suite is truly a private retreat where you can easily escape from the family for some alone time. Guest bedroom one has been furnished with two comfortable queen beds with quality bedding, has a mounted flat screen cable TV and a private en-suite which features a large walk-in shower with multiple shower jets. Guest bedrooms three and four are also located on the East side of the home and have been furnished with comfortable queen size beds with quality bedding and mounted cable TVs. One guest room has a desk area located inside the closet behind curtains. These guest bedrooms share the hall bath which has a walk-in shower. The West Wing: The mother-in-law suite, or second master, is located on the West side of the home and is furnished with a comfortable queen size with quality bedding, a mounted cable TV, office space with small writing desk and a private en-suite with combination shower/tub. Through French doors, it has direct access to the pool area and back patio. The backyard is very private and features a beautiful pool and spa. The covered patio has ceiling fans, outdoor heaters, dining area, and an outdoor TV. The large built-in outdoor kitchen features a stainless gas BBQ with 2 side burners, sink and plenty of counter space. Amenities of Note: Indoor laundry room with washer and dryer located in the West Wing. Cable TVs (8 total), located in the living room, kitchen, back patio and all bedrooms. Five Bedrooms (1 King, 5 Queens). Oversized Pool with Spa. Outdoor Kitchen. Wi-Fi. Land line with 200 minutes free on outgoing calls per month in the U.S. and Canada and unlimited free incoming calls. There is a solar cover that can be used to help keep the pool and hot tub warm overnight. The attached garage will accommodate two cars with additional parking in the driveway. Parking on the street is prohibited in this neighborhood. Violators may be ticketed or towed. The owner may accept a small non-shedding dog. This will require owner approval and dog breed and size will be considered. Please mention this when placing your inquiry and we will seek approval. There will be a non-refundable pet fee. Note: There are a few steps in the home. A single step down from the front door into the living room. A single step up from the kitchen to the West Wing, then two steps up to bedroom with two queen beds and large master suite.